No-nonsense, just plain facts about the right diet to help you beat low blood sugar for good. 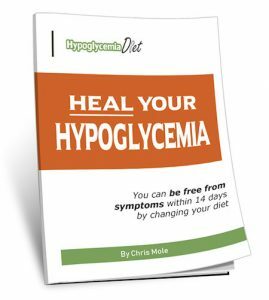 What is the best diet for hypoglycemia? Most experts on hypoglycemia recommend you should eat 6 – 8 small meals a day to keep your blood sugar stable. I have always disagreed with this. I believe it’s best to eat just three meals a day. If you really can’t go between lunch and dinner without eating, then have a small snack in the late afternoon. But aim for 3 meals a day. In the video above, Dr John Douillard gives a great explanation of why eating 6 – 8 meals a day is bad for your health in the long term. The idea behind eating every 2 – 3 hours is to introduce a level of blood sugar stability. But as Dr Douillard explains, the long-term effect of training your body to expect a blood sugar boost every 2 – 3 hours is an eventual deterioration of stable blood sugar, increased anxiety and increased weight gain. The exact opposite of what you want! Hashimoto’s and Hypoglycemia – is there a Link? I tried 6 small mail a day and ended up perpetually wanting more so that I ate all day long saying to ‘myself ‘well I am only eating snacks’. I soon stopped that as my life was being taken over by food and I felt bloated. Dr D’s explanation is clear and logical. Thanks Chris for introducing me to him. I will check his website and am interested to see if he says anything abut grains. Yes, that’s exactly what happens when you eat 6 – 8 small meals a day. You are thinking about food all day long. It’s not necessary if you eat 3 balanced meals, which have protein, fats and carbohydrates to give you a slow release of energy over several hours. Sounds good, but what do you recommend when you’re trying to gain weight and still eat healthy? That’s a great question. It’s something I face myself as I tend to be slightly underweight. However, you can still maintain a healthy weight by eating just 3 times a day. I have proven this myself. Eat when you are hungry and stop when you feel satisfied but not stuffed full. If you are genuinely hungry between meals i.e. if you haven’t eaten enough at the previous meal, then have a small snack to tide you over until the next meal. But over time you can learn how much you need to eat at each meal so you don’t feel hungry between. When your body is healthy, it will naturally maintain a normal weight. Hi Ellie, if you are trying to gain more weight, just eat more food. I know that sounds simplistic but it is really the only way. Dairy products are great for putting on healthy weight. Eggs are also a perfect food, as well as bread and butter. I like organic sourdough bread with butter and cheese. That’s a great combination for keeping your blood sugar stable and gaining weight. As someone who has been underweight myself at times, I can tell you what has worked for me. First, eat a good breakfast, with cereal and milk plus eggs and toast with butter, and a cup of coffee or tea, with milk. I only eat organic, non-homogenized dairy products. Raw (unpasteurized) dairy is even better but it’s hard to get. For lunch, have a serving of protein such as chicken, fish or cheese with wholegrain bread and butter (thick slices of bread and plenty of butter) plus vegetables – salad or soup. A banana (ripe) is also good plus a cup of tea with milk. If you eat enough at lunch time it should keep you going until 6pm when you eat dinner. But if you really need something in between, have a small snack in the late afternoon. Then dinner can be a serving of protein, plus plenty of carbohydrates such as potatoes, rice or pasta etc, and plenty of vegetables. A small dessert is OK, stewed fruit and cream is good, or anything really as long as it doesn’t contain too much refined sugar. A total score of less than 20 is within normal limits. A higher score is evidence of hypoglycemia and would indicate further testing. 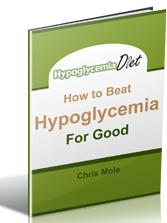 "How to Beat Hypoglycemia for Good"
- a refreshing, common-sense approach to eating right to beat low blood sugar. Get this helpful report now. You can be free from symptoms within 14 days by changing your diet. Should you stop drinking coffee and tea?